Want to make New Year’s Eve extra special? Then, serve one of mixologist Scott Beattie’s incredibly creative, incredibly satisfying cocktails. When he helped open the posh Healdsburg restaurant, Cyrus, Beattie created a whole menu of irresistible cocktails made with artisan liquors, heirloom produce, fresh herbs, and unique housemade garnishes. My husband and I were lucky enough to nab a seat at the elegant, serene bar one evening when Beattie was there, mixing the cocktail concoctions, himself. I remember a gentleman sitting a few seats away, who took his first sip of Beattie’s glorious Autumn Apple cocktail. The man leaned back in his chair with a dreamy look on his face. “This is the best thing I’ve ever tasted,” he declared. When my husband ordered one, and we each took our first sip, we knew what he meant immediately. It was the freshest tasting, and most balanced cocktail I’d ever had. You’ll find the recipe for that drink and others in Beattie’s new book, “Artisanal Cocktails” (Ten Speed Press). These are cocktails that you can’t just stir up on the fly. They take planning, shopping, preparation, and a fair amount of money for all the ingredients. But if you want to make a cocktail that will dazzle, Beattie will teach you how in this book. I chose to try my hand at the relatively simpler Waverly Place Echo. I say “relatively simpler,” because this citrusy, winter cocktail still necessitated the purchase of pricey Hangar One Mandarin Orange Blossom vodka, plus the making of two garnishes — candied Meyer lemon peels, and five-spice marinated Mandarin orange segments. It’s like sunshine in a glass, an instant mood lifter. It goes down easy, with its sweet, citrusy, spicy, slightly grassy flavors, and highly floral aroma. It would be killer with Asian food, especially Thai or Vietnamese dishes with their profusion of fresh herbs. 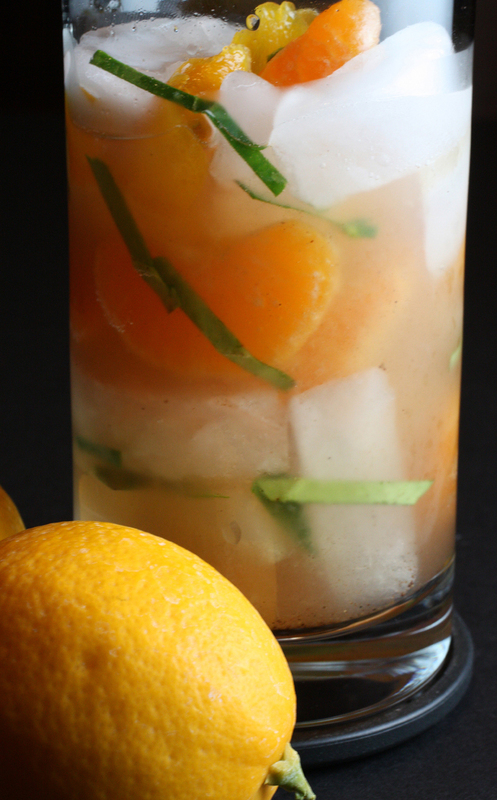 In a mixing glass, combine the vodkas, mandarin segments, lemon juice, candied peels, syrup, lime leaves, and seltzer. Stir everything around a bit, add a full measure of ice, and shake a few times. Pour the contents into a tall collins glass to serve. To make the syrup, process the spices to a coarse powder in a spice or coffee grinder. Heat a stainless steel pot over medium heat, add the spices, and follow the instructions on page 20 to toast the spices. Once fragrant, add the simple syrup to the pan and bring to a boil. Reduce the heat to low and add the honey. Simmer for 5 minutes to infuse the syrup mixture with the flavor of the spices, then remove from the heat. Let the mixture cool to at least room temperature, then strain it through a fine-mesh strainer or chinois to remove any solids. The syrup will keep for up to 1 month if refrigerated in an airtight container. Remove the outer peel of the mandarin and any white stringy matter clinging to the fruit. Separate the segments and place them in a bowl with the syrup. Let them marinate for at least 15 minutes before using. The segments will last for about 1 week if kept refrigerated in an airtight container. Using a potato peeler or a sharp paring knife, remove the zest from the lemon in long, wide pieces from the top of the lemon to the bottom; I usually get about five pieces of peel per lemon, but be aware that Meyer lemons can vary quite a bit in size. Avoid the white bitter pith as much as possible. Use the lemon for the freshly squeezed juice called for above. Heat the simple syrup in a stainless steel pan over high heat until it boils. Add the peels, bring the syrup back up to a boil, then reduce the heat to low and simmer for 5 minutes. Let the syrup and peels cool to at least room temperature before using. The peels will last for up to 1 week stored in the syrup in an airtight container and refrigerated.